Pentatonix fans, we’ve got some massive news for you!! The sensation a capella vocal group Pentatonix are about to release another full-length studio album entitled “PTX Presents: Top Pop Vol. 1” and they’re accompanying the release with a MASSIVE North American tour!! 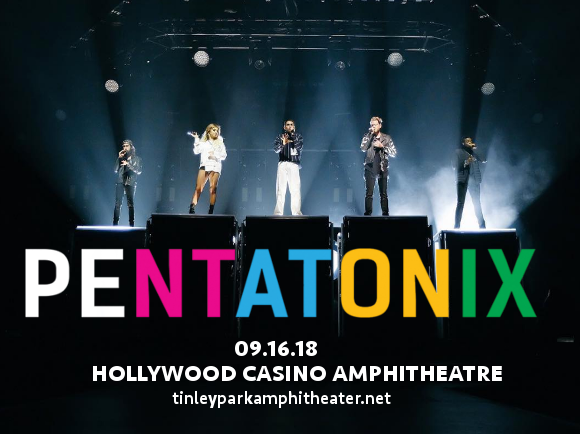 Coming to the Hollywood Casino Ampitheatre on Sunday 16th September 2018 – tickets are available now, but they’re going to go QUICK – don’t delay in getting yours!! Pentatonix's self-titled debut album hit the top of the Billboard 200 albums chart in 2015, an incredible feat for an a capella group! Their song, "Can't Sleep Love," was awarded Gold certification by the RIAA! The same year, they became the first a capella group to win Best Arrangement, Instrumental or A Cappella at the Grammy Awards, and went on to repeat the achievement the following year!! The 2018 tour will hit 39 cities across North America, kicking off in Utah’s Salt Lake City and visiting all major cities including Dallas, Phoenix, Austin and Atlanta!! The new album is set to feature four original songs and four covers, including the freshly released cover of “Havana,” by Camilla Camello. Watch their awesome cover below, but don’t wait too long – those tickets won’t last! Grab yours while you can! !